A Different Ending Every Game! The case of Jack the Ripper is reopened in this innovative card game that combines the strategies of traditional rummy with the elements of an exciting mystery. "Mystery Rummy is one of the best games around. It's totally addictive. Anyone who loves Rummy will enjoy it because it is basically Rummy with a few special cards. As a fellow game designer, Mystery Rummy is one of those games that immediately had me wondering why I hadn't thought of it! It is the elegance of simplicity." Cards measure: 2.5" x 3.5" Box measures 5" x 6.5” x 1.75"
Mystery Rummy: Jack the Ripper adds some interesting extra elements to the standard rummy model, and the game's structure fits the theme particularly well. Are you looking to step up your game, to move out of the realm of “same old…same old” and try something new? 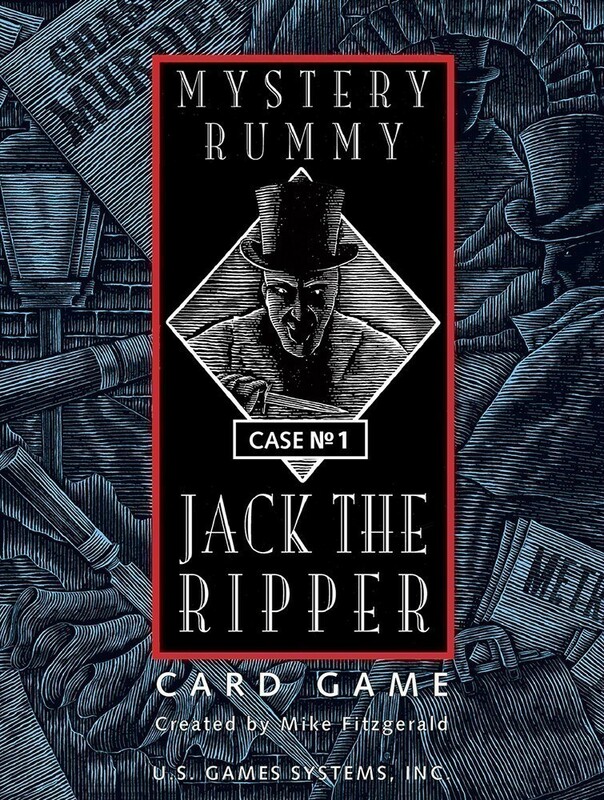 Then come on over to the dark side and give “Mystery Rummy: Jack the Ripper” a try. The game features all of your favorite rules of Rummy, with card melds, points, and the like. To go with this, the cards are all themed in a Jack the Ripper “London by Gaslight” theme. There are victim cards, scene cards, evidence cards, and suspect cards. To begin, someone must play a victim card before any evidence melds can be played. 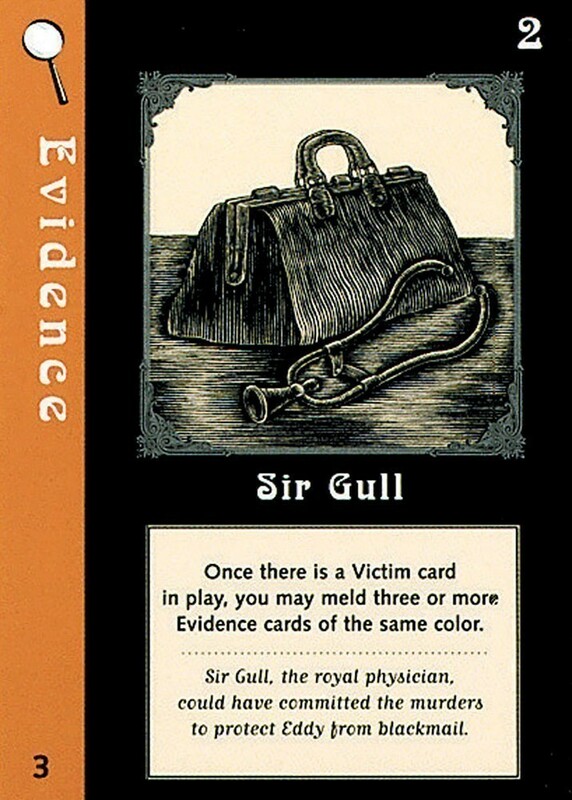 Once a victim has been revealed, the players can begin placing their melds of evidence cards, which indicate which one of the 6 suspects might be the Ripper. 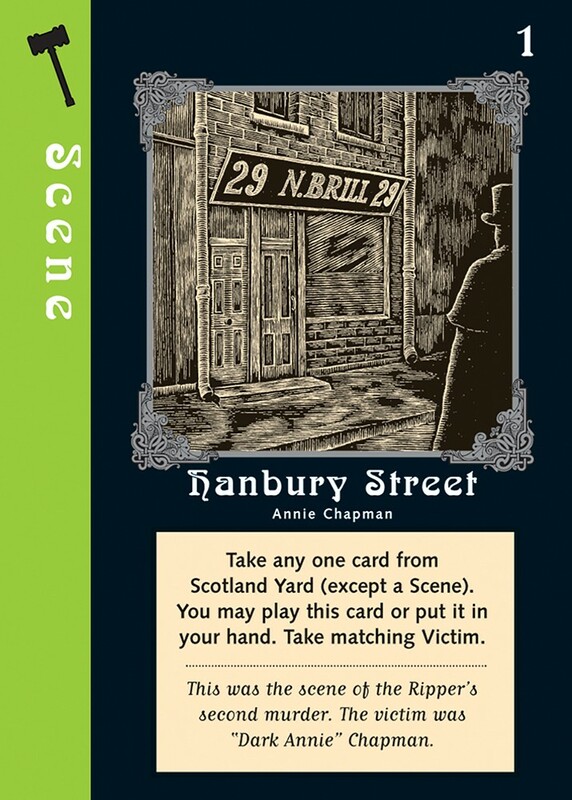 The more evidence cards in play, the more likely the given suspect is the infamous Ripper. 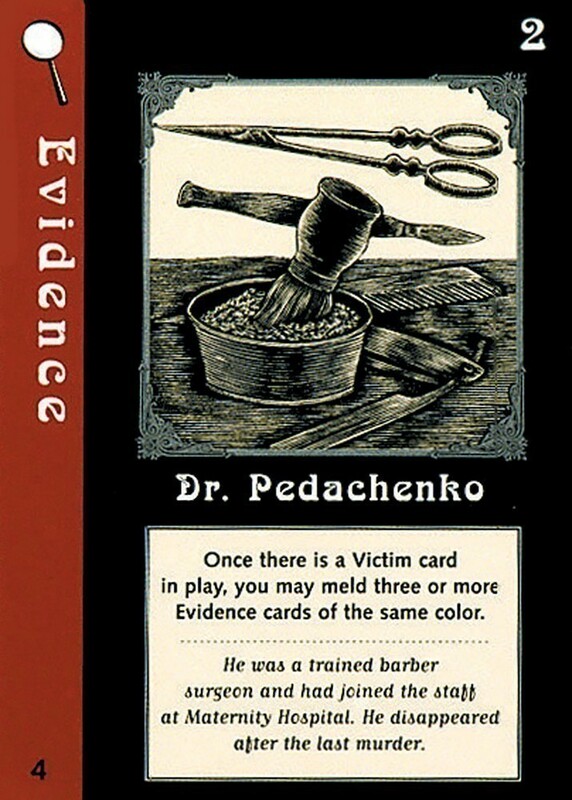 There are other cards in the deck as well to add more flavor and options to the players, including the dreaded “Ripper Escapes” card, which can only be played if all of the 5 victims are in play. The player who successfully plays this card immediately wins the hand and is awarded 35 points. The cards are of good quality and the theme is present throughout with wonderful artwork and flavor text on all of the cards giving background information on the real Jack the Ripper. My only complaint is that several of the colors are quite similar and we got those mixed up when we once attempted to play by candlelight when the power went out. Other than that, it is a fun game that is easy to learn after only a few hands and is relatively inexpensive. Even the box is cool! It’s in the form of a book with a black ribbon to help you take the cards out of their insert. I wholeheartedly recommend this game. It is most enjoyable with 2 players, but is fun with 3 or 4 as well. This is the best of the Mystery Rummy games. It is the most strategically rewarding, offering many opportunities to alter ones position in the game. Also, unlike the rest of the Mystery Rummy games, this game has unique game mechanic which creates tension the longer the game goes on and allows one person to "shut out" the other players even if that player didn't empty their hand (the normal way for ending the rummy game). Not that the game is difficult to learn, but Ripper is much more complicated than the other games of the series and has many more gavel cards. The complexity creates a wonderful game, but for players looking for something a little less complicated, Mystery Rummy 3 - Jekyll/Hyde offers excellent game play and is much simpler. This is a great game. Being similar to rummy it’s easy to learn yet different enough to make it even more entertaining. The process of collecting evidence and placing victims with scenes as you build a case against a particular suspect is challenging and fun at the same time. My favorite aspects of the game is the explanations on the cards. These explanations give insight into the Whitechapel Murders, which occurred in the East End of London during 1888. I found them so interesting I am now reading The Complete History of Jack the Ripper to get the full story. An awesome game all around!